I am guilty of contributing to the delinquency of fruit. Yes, the other night, I got fresh figs tipsy, even bordering on wasted. But boy, did they taste good that way. These black Mission beauties got a luxurious overnight spa soak in a tub of Port. 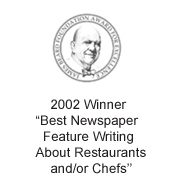 It was all in the name of making “Chicken Fricassee with Figs and Port Sauce,” which was published in Bon Appetit magazine, way back in 2007. The recipe is from the now-shuttered Cremant restaurant in Seattle. The figs definitely need to soak overnight, so plan accordingly when making this dish. A whole chicken is cut up into six pieces, each of which is wrapped with slices of prosciutto to lend more flavor and help keep the flesh moist. The chicken is braised with a little of the fig-port sauce, as well as chicken stock, tomatoes, shallots, garlic, celery, and coriander. Meantime, the Port that the figs had been marinating in is reduced in a pot on the stove until slightly syrupy, then the figs are added back in. Arrange a piece of chicken on each plate and serve with a few of the drunken figs and a little of the reduced Port sauce. Sweet figs and salty-nutty prosciutto are made for one another. The Port adds a concentrated fruity, almost raisin-y flavor to the dish that’s not cloying in the least. And yes, the figs retain a nice boozy kick that only adds to the nuanced complexity of the dish. So, go on, get your figs inebriated. I promise not to report you to the fruit police. Place figs, Port, and 1 bay leaf in medium bowl. 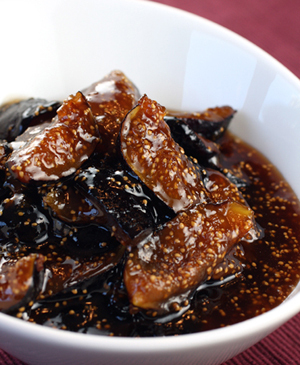 Cover and let figs marinate at room temperature overnight. Sprinkle chicken with salt and pepper. Wrap 3 pieces ham around each piece of chicken, securing with metal lacing pins or toothpicks. Melt 3 tablespoons butter in large pot. Add chicken and cook until browned on all sides, about 6 minutes total. Transfer to plate. Add shallots and garlic to pot. Sauté until beginning to brown, about 3 minutes. Add 2 bay leaves, tomatoes, celery, and coriander; sauté 5 minutes. Add 1/4 cup Port from fig marinade. Return chicken to pot. Add 2 cups chicken broth. Cover and simmer until chicken is cooked through, adding more broth if too dry and turning chicken occasionally, about 35 minutes. Meanwhile, transfer remaining Port from fig marinade to small saucepan. Boil until slightly thickened, about 5 minutes. Remove from heat and add figs; cover and set aside.Transfer chicken to platter. Boil sauce until reduced slightly, about 4 minutes. Stir in remaining 1 tablespoon butter. Pour sauce over chicken. Serve with figs in Port sauce. A marvelous falvor combination! That fricassée looks and sounds very promising. YUM! 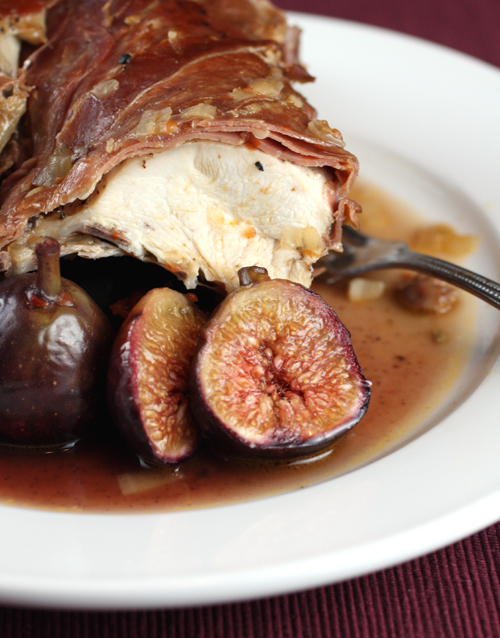 Fig and Port go so well together and you can’t go wrong with chicken wrapped in ham! Oh my goodness, that sounds amazing. I have some fresh figs and I will have to try this. 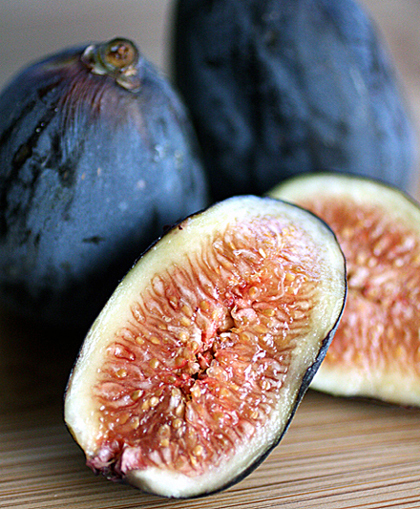 I adore figs….so this is a huge inspiration to use them in another way! This is my kind of recipe. Love figs and pork together and with a nice porky background…perfection. 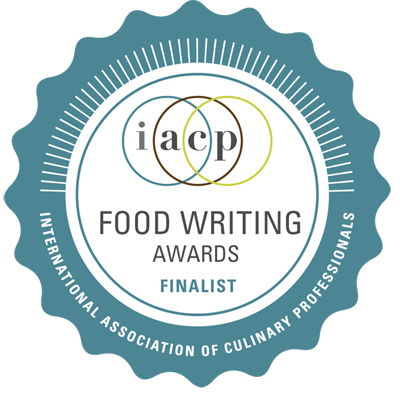 I meant to say figs and PORT. But yes clearly pork too! What a fantastic dish…gorgeous flavors! 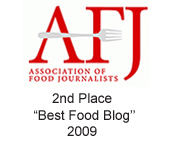 After reading about the Mystery Basket Battle I had to click over to this! 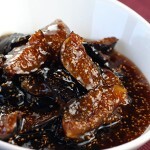 I just bought a flat of figs and soaking them in port is a great idea! Yay, can’t wait for fig season over here so I can try getting them blasted 😛 Great recipe! i’ve only recently come to love figs in dessert-type applications, and now you want me to do savory? frankly, this looks awesome–great flavors! Wow does this look extraordinarily delicious! Truth be told, I hover around the figs at the market but for some odd reason they scare me. But this chicken and tipsy figs inspires! Fabulous! And you can do the naughty to fruit anytime! Figsswimming in Port now…coming to dinner aside Laura Chenel’s Chevre. Thank you (again) for the inspiration, Carolyn.